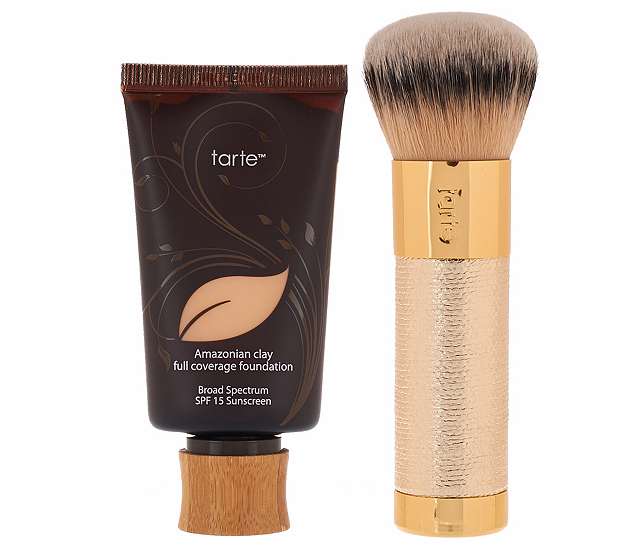 Amazing Tarte Cosmetic deals on QVC!! My all time fave foundation! This foundation is normally $39 just on its own. QVC’s special includes the Amazonian Clay Foundation AND a limited edition brush. This brush is a MUST for applying this foundation. I purchased the brush that Tarte sells and it retails for $34. This awesome deal above is just $39!!! Plus QVC allow you to make payment plans if needed. I cannot wait for mine to arrive! This gift set is only $59.94! 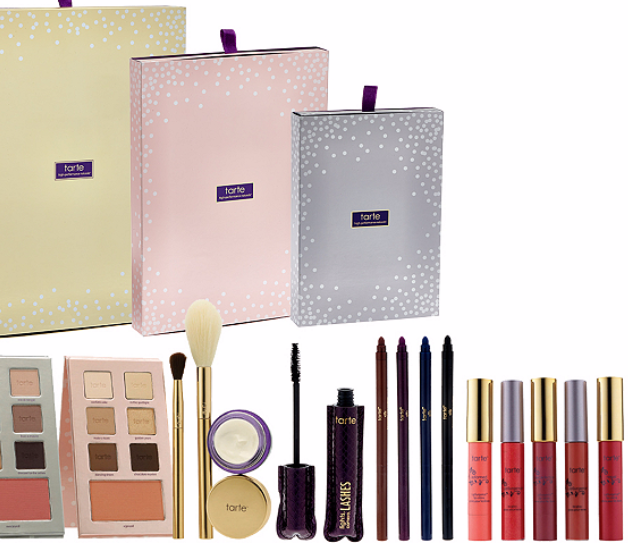 If you have never tried Tarte Cosmetics before I highly recommend getting this gift set! It lets you try out their best products. This QVC special, that includes everything in the picture above, is only $59.94!! The LipSurgence alone cost $24 each and they include 5 of them! If you don’t buy this for yourself this would also make a great gift with the holidays coming up! Head over to QVC and check out the other Tarte products they have on sale! I have always been a makeup nut. I love to try different brands and products and over the years Tarte has become one of my all time faves! I love that their products have a ton of natural ingredients in them that also help nourish your skin. I have been obsessed with their Amazonian Clay foundation for years. It is my go to for every day wear. It has great coverage and stays on all day long AND doesn’t make my skin super greasy by the end of the day. They say that is due to the amazing benefits of the clay. I get emails from QVC when they have specials on Tarte because their specials are too good to pass up so I wanted to share them with you guys!! What is your favorite makeup brand and have you ever tried Tarte before?? I discovered Thrive Online Market about 5 months ago. This amazing website caters to those of us who love organic and natural products but may not be able to always afford those options. Thrive is an online market that sells all those amazing brands that I love, Seventh Generations, Mrs. Meyers etc. that are always pretty pricey in our own grocery store, for 25-50% off retail. 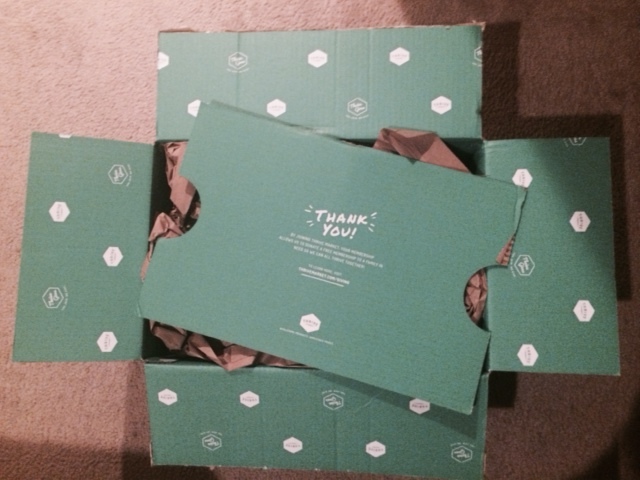 I placed my first order a couple of months ago and I was so pleased with everything from the delivery and packaging to the customer service. I got 20 items all different brands for $58.00 plus free shipping. They not only gave me free shipping but I also got $10 off for referring friends, $15 off for having a membership and receiving their emails, oh and did I mention I received the membership for free for the first 30 days?! This site is really trying hard to cater to their customers and it shows. Not only do they have cleaning products and beauty products all in our favorite natural brands but they also have tons of food! I love Amy’s soups and at my Stop & Shop they are about $3-$3.75 a can and I got an amazing deal 2 cans for $4.45! I focused this purchase mainly on cleaning products but I did also get an awesome all natural sunflower seed butter as well as farro, both of which I have been loving! I have really been working at changing my lifestyle by cutting out chemicals where I can so I figured why not start with the products I use all over my apartment. I am so happy with all the cleaning products I purchased from them, and yes I started cleaning the second I opened the package from pure excitement! My next purchase is going to be focused more on ingredients needed in vegan dishes. I cannot find arrow root, tapioca flour or nutritional yeast in my super market so I plan on buying all those items that are hard for me to get. I also love this face wash, Bull Dog, it is advertised as a men’s wash but I got it in one of my glam bags and fell in love. It doesn’t dry out my skin and contains no parabens, artificial colors, synthetic fragrances, or ingredients from animal sources. I looked at so many stores in my area as well as in NYC and wasn’t able to find it. I was so shocked to see that Thrive carried this face wash and for half the price that it retails for, I am almost out so will be stocking up on this as well! Not only does Thrive have these amazing all natural products for discounted prices they are very socially responsible and give back to the community which is a huge thing for me. They give a free membership to a low-income family for every membership that is purchased. I highly suggest checking out this great site and keeping it in mind next time you are looking to purchase any organic brands!